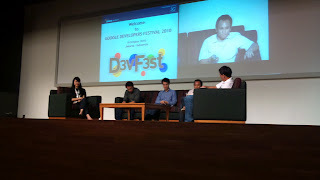 At friday 8th October 2010 I was attending first Google developer event in Indonesia, Google Developer Festival 2010 that was held in Bina Nusantara (Binus), at Anggrek Campus Jakarta. The event itself is aim to introduce new technology usefll for developer most of them relate to use of Google technologies. If I can say personally, Google DevFest is miniature version of annual Google I/O. 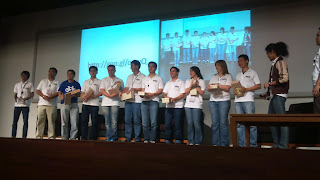 Sadly even though participant have to pay to attend Google I/O, they get HTC Evo and Nexus One. 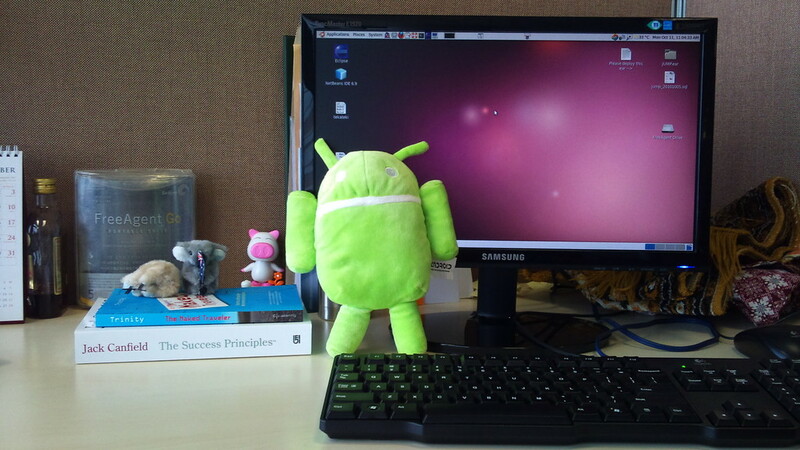 In DevFest at least I get Android puppet and several T-Shirt. Google DevFest Jakarta bring several good session. 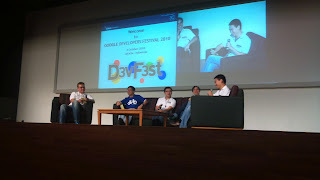 At first there is keynote session that discuss general about current status of the web, about HTML5, about Cloud Computing and of course about Android. The session was brought by Alan Nobble. Unfortunately I forgot about his role at Google. 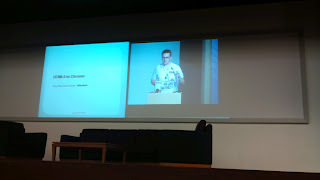 Third session was about HTML5 chrome. The session was brought by Arne Roomann-Kurrik. One impression about Kurrik he is very awesome speaker. I don't bored listening all whole of his session. He speak about HTML5 especially in Chrome. Kurrik made a lot of demo most of it relate of the use of canvas feature in HTML5. At the end he also made a demo how even HTML5 application can take input from hardware sensor. Kurrik moving his laptop up down and turning it little bit to show how the HTML5 application can respond to that input. 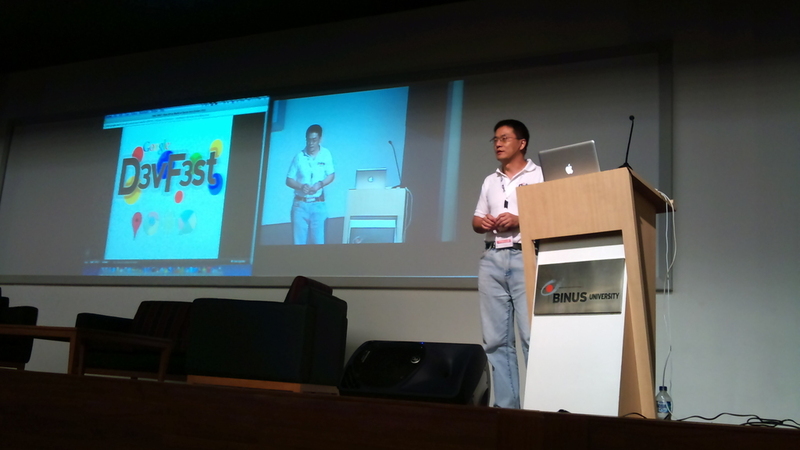 Other great thing, even his good presentation is made full by HTML5. Fourth session was held after break time. The session is brought by Shawn Sheng. 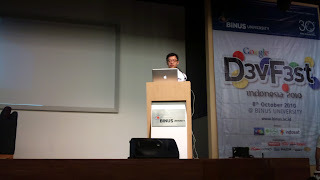 I think he is the the oldest speaker among other speaker at DevFest. Shawn speak about Maps API on mobile. He talk a lot around map implementation on iPhone and Android. At fast the implementation of map API on those mobile device is done in native way. The map is rendered in native widget of Android and iPhone. This approach have some inflexibility because native widget have some limited access to full feature of Maps API. The other approach is using mobile browser when application need to access Maps. This approach can fix flexibility problem but make application looks unnatural. Then Shawn offer to use hybrid approach by using web widget either on Android and iPhone. So the Maps interface still integrated on its own application widget without need to open browser but the application can access full feature of maps API. 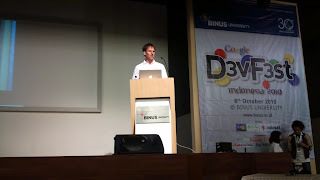 Fifth session is one of my favorite speaker on DevFest. Timothy Jordan Jordan brought topic about Social Web. If you see this person, you maybe will think he is more like rock band vocalist rather than software engineer speaker. He bring the presentation with very awesome. 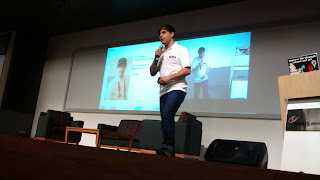 He also make a lot of joke around the session that make the audience feel comfort attending the session. Timothy speak a lot about social web and some open standard relate to that. He speak about oAuth, Atom, salmon-protocol, etc. The next after four session is parallel session. I little bit lost at that evening because the schedulle little bit mess up. There are some session about Android UI pattern and Android Demo. There are also session about Web Entrepreneur panel, with Andrew Darwis from kaskus, Selina Liman from Urbanesia (I made some small talk with her before she go to the stage and the person from Koprol (I don't know his name). Beside that session evening schedule is about lab session practical session from theory of morning session like chrome, social web and Geo API. I myself took Geo API lab session. In that session participant try litle code guided by the speaker. The intention of lab session fundamentally is good. But the problem is because the time so limited, the result is not too optimal. Beside lab session there is also "office hour" the term that aim time for participant to discuss straightly to the speaker about particular specific topic or problem. Last session that act as closing is panel discussion. At the afternoon the committee give chance to participant to write question to the all of speakers. The best question then answered in that last session. A lot of good question and answered with good too. 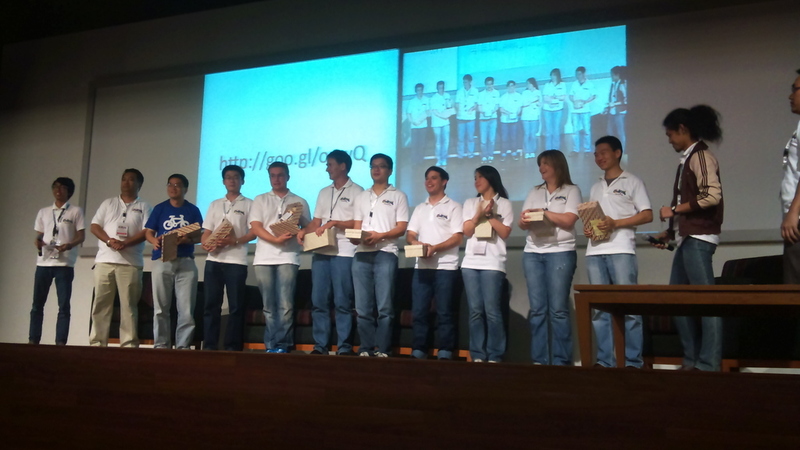 The one of I really remember is when someone questioning: "Why Google evangelist use competitor product?" (competitor here is refer to Apple because most of the speaker use MacBook). But this question can be answered with very elegant. For summary, the event is very great. I have learn many things and have more motivation to learn more, to code more and to innovate more. IT especially relate to web and internet is technology that inseparable from our daily life. There are a lot of opportunities for us to improve that. There are a lot of opportunities to make life from there. Make good application that can be useful also make money from that by monetize it with good entrepreneurial concept. View more presentations from Jon Lamida.